As this week’s NYC Scripture Blitz 2011 continued, Gideons distributed free New Testaments at campuses in New York on Monday. In this video, Richard Graves, a Gideon from Myrtle Beach, South Carolina, tells why he and many other Gideons from all throughout the U.S., come to distribute free copies of God’s Word here in New York City during the 2011 NYC Scripture Blitz of The Gideons International. 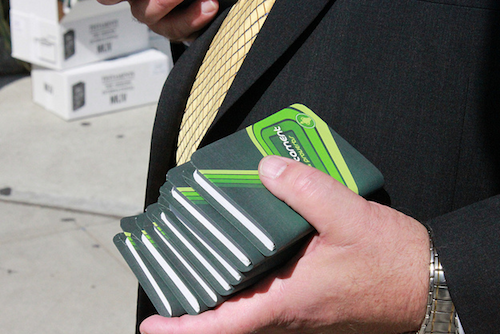 A Gideon hands out New Testaments, one at a time, in Brooklyn, NY. September 19, 2011. 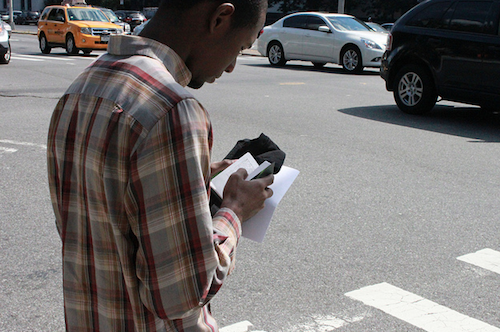 Yesterday, Richard was handing out copies of the New Testament to college students at a college campus in Brooklyn. Gideons give out approximately 1.5 million Scriptures each week. This week, they plan to distribute nearly 400,000 copies of God’s Word in NYC alone. I am praying for a “great harvest of souls” Wow–I am proud of my Brother Richard Graves. I was with him in New York some–10 years ago–we were on a college campus–passing out Scriptures. The place that I was assigned to man–it was very slow. Well the Lord changed that this way -A dressed up gentleman came out of the building and told me, “you cannot be at this door, you will have to move”. I asked him very politely, where to, He replied, “come with me” and I did . I could barely keep up –Passing out Scriptures–with a “word of witness”, so many people were coming by this door. A great blessing. Praises to Jesus! Richard knows how to deal with the good people in New York–especially the police personnel. He can park where others cannot. Get him to explain it. God’s blessings to all my brother Gideons who are distributing the word of God right now across the world. I fully expect that when the Lord comes for His church, he will leave the Gideons until the very last so as to ensure every soul possible can be saved. I’m in awe of God once again that He has arranged a Bible distribution in NY the week the UN will be meeting and possibly voting to allow statehood to the Palestinians. So important we pray these Bibles get into the hands that need them the most. And remember to keep praying for Israel! Praise God for the beautiful work going on and the thousands of souls that will be saved. I am a Gideon member from Nigeria and we are also planning local blitzes for this year. Pray for us. soy miembro de los gedeones en Colombia. también en Colombia estamos realizando este hermoso trabajo para la gloria y honrara de Dios bendiciones hermanos. Actually, I really took a copy Gideon Bible Light Blue Dual Language Mandarin and English given to my friend who haven’t read the Bible while I attended holiday school camp where Gideon volunteers came to gave their message saving grace of the LORD Jesus Christ through the 4 major Good News which brought many Chinese to become Christians. It’s just too few copies cause me to regret [I couldn’t get 2nd one for my junior friend which will be able give to her friends in high school]. Previous post: The Gideons Present Scriptures at Historic Ladder Company 18 of the F.D.N.Y.